Welcome to Oak Grove Plantation! 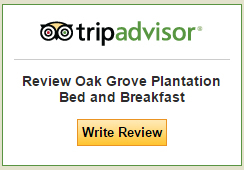 Oak Grove Plantation is listed as one of the top 14 eco-friendly inns in the U.S. on Bed and Breakfast.com. We have been given the Virginia Green Travel Leader Award by Virginia Green for reducing the environmental impacts of our B&B. Read more here. Set aside your hectic life for a moment and let us pamper you, where the pace is slower and the hospitality warm. 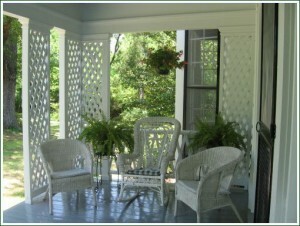 Your visit to Oak Grove Plantation starts with a glass of lemonade or iced tea served leisurely on our front porch overlooking 400 acres full of Southern pines, oaks and teeming with wildlife…crickets, birds, frogs, box turtles and an occasional fox. After you are shown your room, you will be given a leisurely tour of the innkeeper’s ancestral home. After the tour, you will have plenty of time to see Civil War and Revolutionary War landmarks, car racing venues, antique shops, lakes and museums. In the evening, we’ll direct you to some of the area’s fine restaurants, not far from the Bed & Breakfast. After a refreshing night’s sleep in one of the three guest rooms, you’ll awaken to the smell of our specialties such as Cluster Springs Egg Puff, Lemon Souffle Pancakes, homemade biscuits or muffins and coffee or other delicious choices in the Victorian dining room, with the sun shining in through the full-length bay windows. You may want to read a book on our cheery sun porch, go on a wildflower walk or have a reiki treatment from the innkeeper…a hands-on soothing and relaxing exercise. Whatever you do, you’ll return home rejuvenated, wanting to come back again. © Copyright 2014-2017 Oak Grove Plantation. All Rights Reserved.